Scott Davidson, 33, was an all around athlete and “true team player” who nonetheless won more than his share of MVPs. He played on baseball and basketball teams all through college, and was named captain in his senior year. A 1990 newspaper column about him was titled “Still Crazy After All These Years” referring to his competitive spirit. 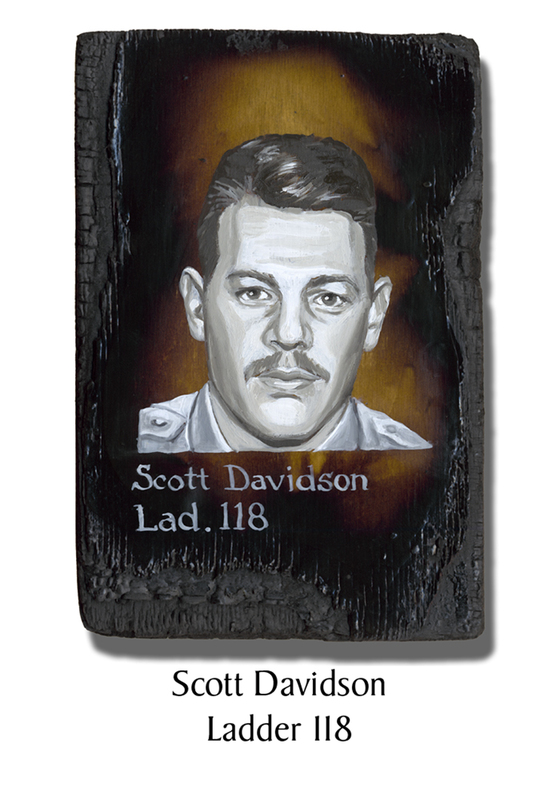 Davidson was nicknamed “The Dog” at Ladder 118 for his habit of “borrowing” the boots and clothes of his fellow firefighters. “Materialistic things were not of importance to Scott,” said his wife. He was also an “unabashed patriot” who loved all things American. His body was found in late November. This entry was posted in Better Angels Stories and tagged 343, 9/11, better angels, Dawn Siebel, FDNY, firefighter, firefighters, firefighters of 9/11, Ladder Co. 118, LODD, Manhattan, memorial, NFFF, paintings, portraits, Scott Davidson, World Trade Center, WTC. Bookmark the permalink.